MANILA, Philippines - Their Majesties, Emperor Akihito and Empress Michiko of Japan have arrived in Manila today, January 26, as part of their peace pilgrimage which aligns well with the sixty-years of celebration of the restoration of diplomatic ties between Manila and Tokyo. The visit of the royal couple in the country will be their first being Japan's figureheads as the two were just crown prince and princess when they first visited in 1962. The Imperial Highnesses will be gracing events in Manila on January 27 and 28 including a visit at the Heroes' Cemetery before heading to the towns of Caliraya and Los Banos in Laguna on January 29 to pay their respects to the war memorial erected for the unsung Japanese and Filipino war veterans. The two royalties will leave the country back to Japan on the 30th. Japan wants to reinterpret its constitution, will there be a Japanese version of VFA soon? The state visit of the Japan's imperial head provides a glimpse of what the Philippines and Japan had become six decades after reestablishing their friendship. The visit as also being rumored, may be also view as part of Japan's Prime Minister Shinzo Abe’s strategy to consolidate the force that the two countries were able to forged over the past as Abe has been very keen to reinterpret the pacifist constitution of Japan to allow itself to flex its military muscle beyond the boundaries of its waters particularly in the shores of Manila. It can be noted that the Philippines has been generously receiving various forms of grants from the Japanese government ranging from financial, technological and social aids. The two countries were also discussing the possibility of crafting a 'VFA-like' agreement in which Japan will be able to provide the transfer of military equipments to strengthen the 'pacific block of force' that might be able to counter mainland China's aggressiveness and rising influence. This revitalization of bilateral relations is clearly evident as the Japan's defense minister will also visit the country this summer. President Aquino is set to welcome the royal visitors upon their arrival. 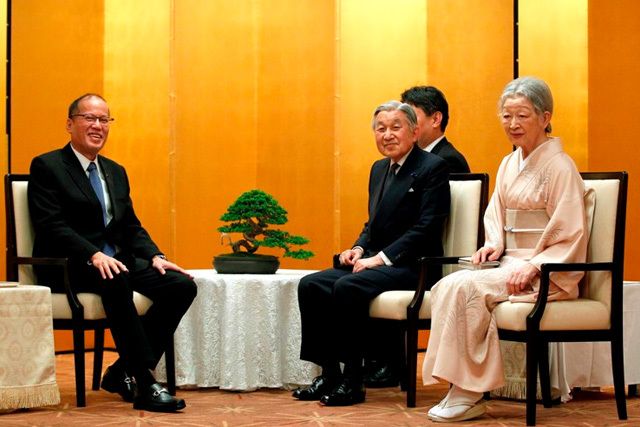 There will be no political agendas that will be discussed during the visit as their Majesties are only representing Japan as symbolic leaders, abiding by the post-war constitution recommended by the United States. Prior to this, Aquino was awarded the Grand Cordon of the Supreme Order of the Chrysanthemum, the highest honor being given by Japan to its citizens or to leaders of state as a testament of genuine friendship. Aquino was also given the opportunity last year to deliver a message to the National Diet, the equivalent of the House of Congress in the Philippines.